Germany’s current account surplus–the amount its exports outpace its imports–recently hit 270 billion euros, close to 8.9 percent of its gross domestic product. This upward trending trade surplus shows little signs of slowing and Germany’s current account balance may rise above 9 percent of its this year. 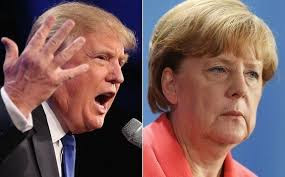 Despite years of criticism from the Obama administration and the International Monetary Fund, Germany has shown no willingness to address the persistent imbalance. Germany’s persistent current account surpluses add to German GDP while they subtract from the GDP elsewhere around they [sic] world. Germany is not just exporting products–it is exporting stagnation, job losses, and deflation. Germany’s trade surplus with the U.S. is particularly large and damaging. It exports high-end manufactured goods to the United States–such as cars, auto-parts, chemicals and airplanes. Cars, for instance, make up more than 10 percent of its exports to the U.S. A more balanced trade in these goods would mean many more high quality jobs in the United States in regions that badly need them. In this debate Trump and the media take the socialist side, which is the economic thinking that surpluses are “bad, very bad.” The socialist argument is based on the faulty notion that one nation cannot grow richer except at the expense of the other nations it trades with. It imagines the world is a big poker game with a fixed pot in which the winners take the money of the losers. Such bad economics is ancient, much more ancient than mercantilism. Had Cain not killed Abel over a sacrifice he would have eventually murdered him over trade balances. The West had enjoyed a period of about a century of virtually free trade until the late 19th century when German socialism began to destroy the economy and jobs. But socialists never blame their own policies. Instead they blamed foreigners, especially those who made the evil goods that German housewives loved to buy. Ancient poker economics had never died; it was just hibernating. German socialists woke it up and put it back to work destroying everything in sight. Ordinarily, currency adjustments would ameliorate the effect. But because Germany is part of the euro with many countries still in or near economic slumps, currency appreciation does not adequately correct the imbalance. The euro is basically acting like a form of currency manipulation for Germany. And with interest rates at or near zero around much of the world, there’s very little central banks can do to address the imbalance or the effect it has on global wealth. So Germany is manipulating the Euro through the European Central Bank, even though the exchange rate of the Euro is the same for all European countries? Wow! The manure is really getting deep. Most of Germany’s exports go to other European countries. So what really causes persistent trade deficits and surpluses? Under a gold standard trade surpluses are mainly a factor of productivity. The more productive country will export until the importing country runs out of gold. Long before that happens, wages and productivity will adjust in the importing country and trade will balance until productivity in either country changes again. In the modern world in which the state can print as much money as it wants, trade deficits are largely caused by government deficits. Productivity plays a role, but it is overwhelmed by the forces of government deficits and money printing. Take the US as an example. US citizens don’t save enough to finance the deficits of the federal government, so the feds have to borrow from foreigners. Who saves enough to finance such enormous deficits? Mostly China and Germany. But the US government can’t spend euros and yuan. It needs dollars. So how do Germans and Chinese get the dollars to loan the feds? By selling us stuff they make. Of course, for the process to work the Fed has to comply by printing the dollars. US citizens don’t want to hold those extra dollars in their bank accounts so they export them by buying German and Chinese stuff with them. If the Fed didn’t print the new money, interest rates would rise and US citizens would save more to finance government borrowing. The feds are in reality borrowing from the Fed, but that is illegal, so they have to go the roundabout way of borrowing from it through the Chinese and Germans. But that route causes the hated trade deficits. Of course, if they borrowed directly from the Fed the same things would happen; US citizens would export the extra currency. If they don’t like trade deficits with China and Germany, US citizens can do a couple of things. They can save more, but that’s unlikely in the current low interest environment. The Fed can quit printing money, but that is unlikely given their poor understanding of economics. The only other option is to have the federal government cut spending and raise taxes, neither one of which is popular with the voters.